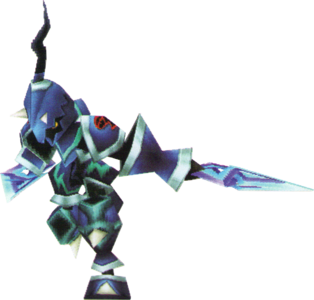 This sword-wielding Heartless's skillful defense makes it tough to finish off. Its spinning slash has the added effect of damage-draining HP from victims. Watch for it, then evade or deflect it with a block. The Zip Slasher is an Emblem Heartless that is found in Kingdom Hearts 358/2 Days. A Zip Slasher is a relatively small, humanoid Heartless covered from head to toe in blue, silver, and cyan armor. The armor on its legs sport white spikes. Its helmet sports two short, white spikes and a long, twisted, black antenna. A small opening in the front just barely exposes the Zip slasher's black face and glowing yellow eyes. Its most notable features are the light blue, interweaving blades in place of each of its hands. It has two Heartless emblems, one on each of its shoulder pauldrons. The Zip Slasher's name seems to refer to its speed—as "zip" can refer to something moving quickly—and the blades on its hands—a "slash" is a swift cut with a bladed weapon. The Zip Slasher is powerful, as it has high HP and damaging potential. It is immune to all forms of magic (although upgraded Blizzard magic can still freeze it for a short time). Physical attacks are the only way to damage the Zip Slasher. Also only use Limit Breaks when it is low on HP or on its last HP bar, as it can still attack with its deadly combo. It does not hesitate to attack, immediately lunging at Roxas. This tactic is easily predicted, as the Heartless's blades glow green, and can be avoided with careful timing of Guard or Dodge Roll. The Zip Slasher's technique is to do a powerful spinning attack, then lunge toward Roxas with its powerful sword-like arms. Blocking this attack will not stun the Zip Slasher unlike its larger variations, but the Blizzard Block ability will freeze it easily. It should also be noted that the best time to attack is when the Zip Slasher pauses after each attack, which is about enough time for two combos. Also, the Zip Slasher will heal a little bit whenever it lands its powerful water-based combo, which can make this a tiresome battle. Despite its high health, the Zip Slasher can be defeated easily when Roxas revisits the mission. Concept art of the Zip Slasher. This page was last edited on 3 May 2018, at 22:09.